Give your workstation a splash of style when you introduce the UPLIFT Rectangular 1" Thick Bamboo Desktop to your desk setup, featuring naturally-sourced, beautiful bamboo. Our Rectangular 1" Thick Bamboo Desktops are the perfect start to building out the ideal workstation or height-adjustable desk for you. Simply pair with one of our UPLIFT desk frames to get you to that working sweet spot. These bamboo tops are almost double the thickness of other comparable bamboo desks, and are UV-cured using a clean, energy-efficient process with no VOCs or air pollutants, giving you a desk you can rely on for years of healthy work. Choose from a variety desktop sizes for nearly any workstation setup you need. Note: 48" and 60" Bamboo Curve tops are only available with grommets. The UPLIFT Standing Desk with 1" Thick Bamboo top is available in several standard sizes. Rectangular desktops are 24 or 30 inches deep and vary from 42" to 80" wide. Curve desktops are 30 inches deep and vary from 48'' to 72" wide. Choose to add grommet holes to your desktop, or go with no grommets if you don't need cable management. Grommets are located fifteen inches from the center of the desk, to the left and right. We've found that this allows for the best combination of cable management and accessory use. 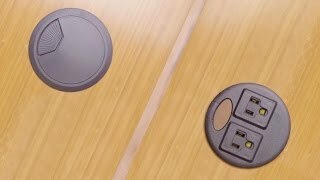 Grommet holes allow for easy wire management or you can choose to add power grommets below for an in-desk power solution. Please Note: 48" and 60" Bamboo Curve tops are only available with grommets.